PharmFresh.TV was the brainchild of Shwen Gwee (@shwen), who co-founded and launched this video podcast series together with Marc Monseau (@mdmonseau). As pharmaceutical industry veterans and social pharma pioneers, Marc and Shwen both realize the importance of “looking outside the box” — beyond the walls of your own company and even the industry as a whole — in order to think differently and develop new ways to adapt social media for the pharma industry. Hence, PharmFresh.TV was born to bring a fresh perspective of social media to pharma and healthcare. 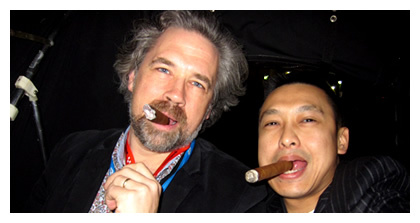 Marc and Shwen enjoying a decadent moment at SXSW 2013. Founder and principle of MDM Communications. From journalism to issues management and PR to digital communications and marketing, Marc has spent my career using different platforms to communicate news and info. Formerly: Johnson & Johnson (Director of Corporate Communications and Social Media), Bloomberg Business News (Reporter).